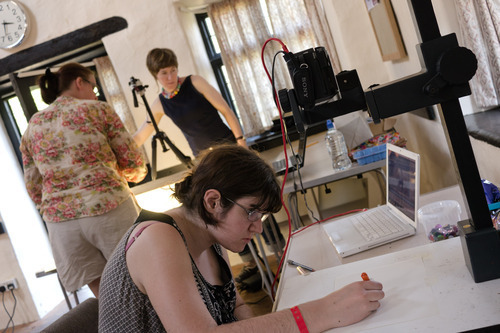 This summer, I was hired alongside animator Anna Aroussi to devise and run the first ever animation course at Dartmoor Arts Summer Schools. Dartmoor arts has been running since 2006. They offer a variety of educational arts events in Devon and providing artists, educators and other individuals with a variety of courses such as metal forging, documentary filmmaking and storytelling through their annual summer school in Drewsteignton. 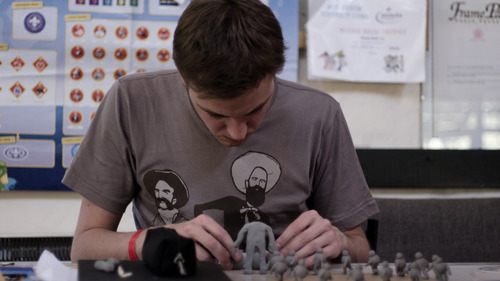 Our objective with this course was to provide participants with the chance to explore a variety of stop-motion techniques from traditional to experimental so that they could find ways of bringing their own aesthetic and practice into animation. 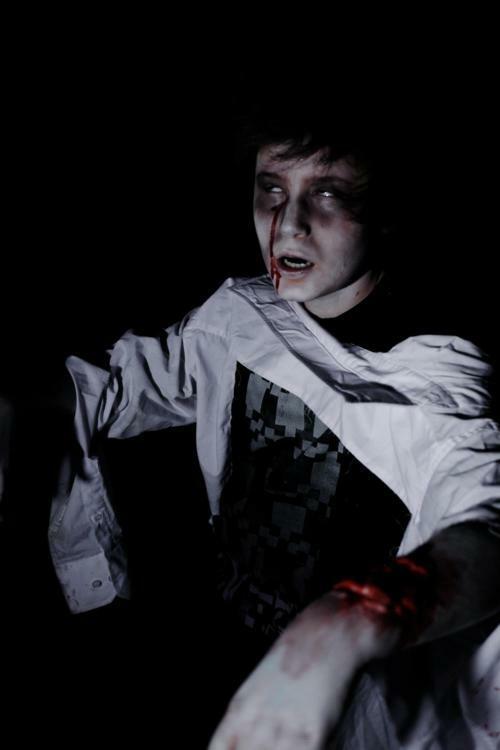 We looked at claymation, 2D stop-motion, mixed media, pixilation, light painting and rotoscoping among other things. As a result, the group made this rather surreal collaborative piece. Due to the small number of participants, Anna and I had to split the week unfortunately. We’re both very excited by the results. however, and hope to return in summer 2013 with the course. Here is another video which gives an idea of the variety activities that the participants took part in throughout the week and how their ideas may have developed into the final film. Recently, I was asked to return to the North Devon Personalised Learning Service in Barnstaple, where I had done a series of animation workshops for RIO last year. The service had some funding to offer some of the same work, but with a new intake of students for 2012. I was there for 3 days, working with the students to produce short animated sequences that would help lead to their i-media qualifications. I had a lot of fun working with them. Their ideas were drawn from already existing television and gaming media, so we used a collage aesthetic to make their animations, printing images from the internet and combining that with craft materials. The result is quite funny in places, similar in a way to Terry Gilliam’s Monty Python’s Flying Circus animations. Anyway, have a look at the work below. I think the students were pretty inspired by the end of the week, seeing their animations playing on the schools’ widescreen TV for all to see. I hope to continue my work there in the future if possible, it would be great. I have recently finished the edit for my most recent documentary covering the pilot year of The Devon Carousel Project, a family led collaborative, community and environmental studies initiative working with children under 5 and their families. This marks the accumulation of a year of work that I have done for the organisation not only as an evaluative filmmaker, but also as a workshop artist. Have a look at the documentary below to see the variety of artistic and educational things that they do within the community. I never thought I would have the opportunity to work with the early years community. Previously, I was always under the impression that filmmaking and animation would be too technical for children so young. Thanks to this project, however, I have been given the space and time to develop models alongside my collaborative partner Stuart (RA Projects) for working with this specific age group. Altogether, it has been inspiring working in this setting. I am surprised by just how capable early years children are when working in animation and film. There seems to be an inherent ability to comprehend the process and even if they don’t understand it at first, they pick it up very quickly. I think, largely, the trick for Stuart and I has been to keep the framework for our workshops very broad in order to accommodate for the varying ability levels of children under 5 and to combine this approach with a clear aesthetic objective so that parents can collaborate and even lead alongside us. Excitingly, it seems that this has been the approach that the whole Carousel Project has taken and as a result, we have had the opportunity to work with many other artists in disciplines such as printmaking, visual art, dance and storytelling to create truly hybrid pieces of work with the local Exeter community. Have a look at some of the work below. There are many more things that I could say about the project, so to save you an incredibly long read here, it’s probably best to direct you our early years animation blog which we have used to chart and evaluate our process over the past year. Stuart has continued with the project while I have moved town, but I hope to return to it if carousel gains more momentum and the opportunity arises. Speaking of which, If you would like to support The Devon Carousel Project and all of the fantastic work that they do, please head over to their Local Giving site and consider donating. It’s more than a worthy cause. Continuing to update my blog here on the new site, next up is my work with Exeter Phoenix’s Freefall group. Last summer I was hired to do a day-long animation workshop with Exeter Phoenix’s youth arts club. The task was to devise and create an animated ident for the group. During a devising session we played around with the idea of mixing different styles of animation within one piece. I showed the group how to do pixilation (animating people) and they were instantly sold on the idea of incorporating it into their animation. In the end, the group decided upon making a 2d flying pig (for obvious reasons…) that would be a mixture of both drawn and cut-out animation. To add even more technical ambition to the project, the pig would interact with some of the members of the group. We had a really fun day putting the animation together. It was a tall order (on Fathers’ day nonetheless), but we managed to finish the animation in just 6 hours. It was really intensive, but as most animation goes, entirely worth the effort in the end. Check out the video below, followed by a behind the scenes timelapse that we had running during the session. Now that I have my website up and running, I think it’s about time to catch up with my blog. A lot of interesting projects have come and gone since the last time I posted so bear with me, I will eventually catch up. I figure the best way to do this is to do a post per project. Let’s see how it goes. First off… the Lyme Cluster Digital Training project that I co-facilitated with Stuart Dawson and Kate Green finished at the end of 2011. Before finalising the project in December with a teachers’ inset day at Charmouth Primary School, we worked at Mountjoy special school in Dorset and produced two magazine-style films mixing video, animation and photography. The films aimed to address the changes that would be happening to the school in 2012 when Mountjoy moves to a new site near the town of Beaminster, Dorset. It was great to see how the students involved adapted to the different artforms throughout the year and what was most rewarding for me was their ability to not only grasp animation, filmmaking, photoshop in such a short period of time, but also their ability to remember and improve upon what they learned. Anyway, have a look at the films below. The first was made in April and incorporated a field trip to the Beaminster. The second film was made in July and expanded on the magazine-show structure. The participants made their own TV which was host to a variety of channels allowing them to make news stories, soap operas, adverts and more. Enjoy.